One of the biggest problems I have when sewing is all of the threads that get strewn across my sewing room. A while back I showed you a quick and easy No-Vacuum Sewing Room Idea. It involved hands and knees but was easier that toting the vacuum upstairs. 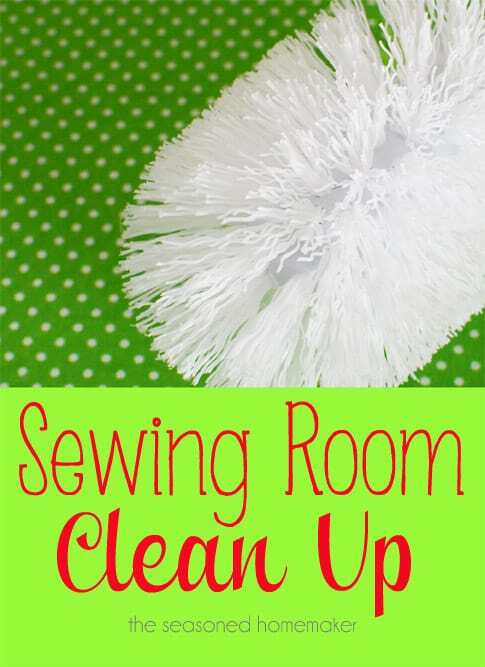 Today, I have something to add to your collection of Cleaning Tips that works especially well in the sewing room. This piece of necessary sewing room equipment doesn’t involve a vacuum, instead it employs hands, but not knees. It costs around $3.00 and doesn’t require electricity. The lowly toilet brush, destined to be hidden behind toilets everywhere can now step into the daylight and be placed out in the open ~ ready to perform a new task. Friends, it doesn’t get much easier than this! Bend, swipe across the threads, pull off, and discard. One walk around the room with my new thread picker-upper and I’m done. Easy, easy, easy. I am officially re-christening this handy sewing room tool. It shall hereafter be known as the Thread Sceptor. Raise them high, ladies. You crack me up! How funny…and so good to know! Thx! First of all, your sewing room is perfect! I especially love the Ikea storage cabinets. And all the space and light!!! The “thread scepter” is pure genius. I don’t like using my vacuum for thread because they get tangled around the power brush. Thanks! A seam ripper tool is perfect for removing those wrapped-around threads (as well as long hair) from the vacuum power brush. Now THIS is why we love your blog. Envisioning how you came up with this brilliant idea is keeping me smiling. As always I so enjoy all of your blog posts. Thanks so much. You are so right Judi, I don’t like turning the vacuum on its side to pull all the threads out of the brushes. 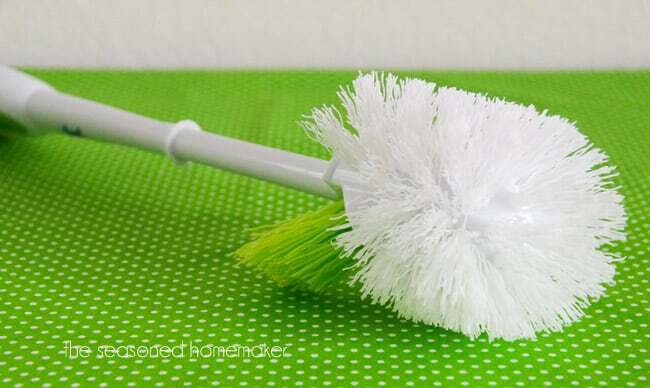 I love the idea of using the toilet brush. With the handle on it maybe it wouldn’t require bending down. It is hard for me to bend down for very long and hard to get on my hands and knees. The knees don’t take kindly to kneeling down anymore. Thanks for the good idea, Leslie. 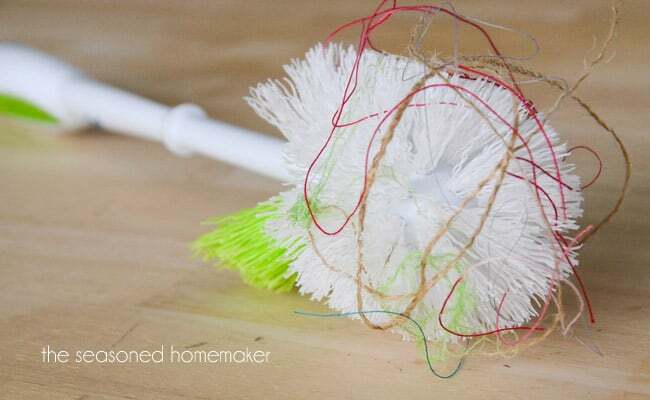 What a great idea, it sure beats having to sit on the floor and pull all those threads out of the vacuum brush. Thanks for such a useful tip, and for only a dollar at the dollar store, it sure beats buying another vacuum for upstairs, besides every time I pull the vacuum out to do just a quick little job I end up doing the whole house. I hate it when that happens. Great idea! It is easy, compact and doesn’t take up any room. I wonder how you thought about using this in the first place. Love your blog, Leslie. If you have an idea about picking up pins would like to hear about that one. A magnet s great for picking up pins. Wouldn’t this also be useful for cleaning the straggler threads on the back of quilt? HOLY GENIUS! 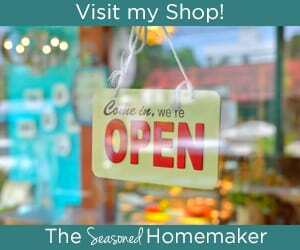 My sewing room is a huge thread and dust ball right now- and you’ve inspired me to get on it! Well, mine doesn’t look like those pictures anymore….but it easier to clean when everything has a place. Great clean up idea for the threads. I keep a little brown lunch sack taped next to my sewing machine so not too many get all over the floor. I currently have a couple of projects going so my problem is clutter – I hate to put everything away knowing I will be working on it again in the next day or two – but I think that is just the way it is when you are creative. I love the paper bag idea…running to Walmart to pick some up! Oh, wow! The toilet brush tip is AWESOME!!! Now to go buy one that hasn’t been USED! 😀 Thanks for sharing! Just wanted to say what a brilliant idea. Thank you for sharing. This.is.brilliant! And much cheaper than ripping out our carpet! I already bought mine and put it good use! Good idea. Another one is use masking tape…just roll in backwards a bit loosely around my hand and then, with hand inside, just roll it along the floor and it picks up everything. 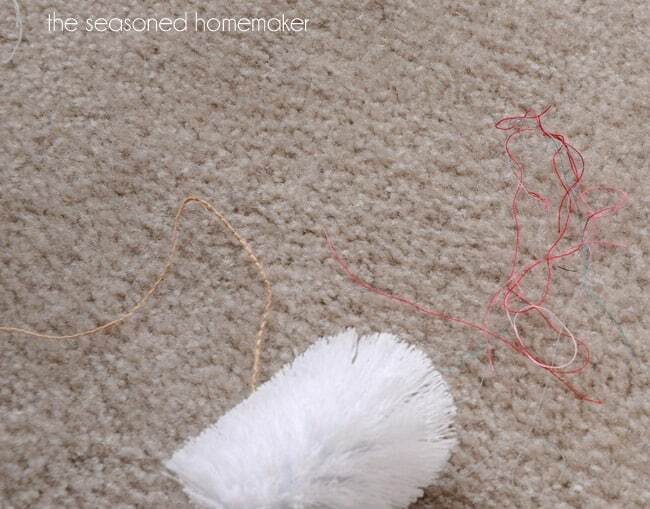 Although he didn’t have to say anything as i know not to vaccum all those threads and tiny pieces of fabric up in the vacuum cleaner…when he found out I was doing this…he was shocked and totally surprised that something so simple could satisfy his demand of “no thread in the vacuum!” rule! How clever! I would love for you to share at Bacon Time, if you have not already. I have not sewed anything for a long time, but I am getting the itch, just bought some pretty ribbons yesterday. I’m over from SMW. This is a brilliant idea and has come just in time as I’m doing the spring cleaning. I’m going out to buy myself one so I can start on my room at the end of the week. Thanks for sharing. Hey! that thread sceptor looks really handy! I need one of those!!! That’s a brilliant idea! Although how I’d explain to anyone who visited my sewing space why I had a loo-brush lying around, I don’t know! I use an empty oatmeal box by my sewing machine for theads and snips and bits of paper, etc. I have one at both machines. Love this idea & the name!! Off to purchase a new one for craft room! Why not use a lint roller I do. I have used a lint roller, but you have to replace it too often. The toilet brush is self sustaining. I have wooden floors in my sewing (ahem…dining) room but have the same problem with threads NOT going in the waste basket….instead I find them on the dog, who loves to keep me company and then wanders through the house depositing “quilt poop” everywhere! The toilet brush works well, but if you have a dog and have a Furminator for their coat, it works better than anything! Brilliant! May I just add that you’ll want to go ahead and splurge on a new toilet brush rather than repurposing your old one? Ha! I purchased a small shop vac made by rigid. It has wheels small [ 2 gal ] but has a powerful 5 hp!! It picks up everything and no tangling around a beater bar. The down side…my husband discovered it and well it is not always where I left it. Hi, I was referring to your white sliding table that is under your pegboard. It has grey legs!